A few days ago, we received an odd product return. Of course, we’re always happy to take care of these — usually, one of our crew has found that the color they ordered doesn’t work for them, and they wish to try another. But this one was something that raised the Cap’n’s ire right quick. 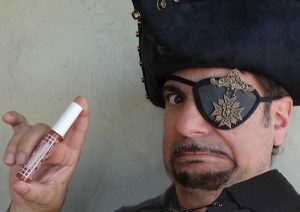 The product returned to us was not, in fact, our own Blackbeard for Men instant brush-on beard color, no. In fact, it was some off-brand bilgewater we’d never seen before. Most likely, the crewman had ordered it from an online seller, and then, finding it was garbage, went to return it. Except, they mistakenly returned it to us, not the company they’d purchased it from. Indeed, that matey was well-justified in returning this product. They sent back 3 tubes of this stuff, and it was all completely dried out. So we have to assume that’s what was sent to the purchaser — three tubes of dried-out rubbish. Looking at the formulation, we quickly saw the problem — they’re using a water-based formula. In the early days of Blackbeard for Men, we tried out a water-based formulation as well, and the results were not pretty. While the product dried quickly and thoroughly, it lasted only about 2-4 hours, dried hard and clumpy, and the shelf life of each bottle was about as long as a fresh-caught sailfish jerking around on the gaff. Which is to say: not long. We continued hunting for formulations until we got the best possible combination of durability and product shelf life: Blackbeard for Men Formula X. It’s so unique, we patented it! So we have to thank that pirate for sending along this misfire to us; and we urge all of ye mateys to be wary buyers! Needless to say, there is only one, genuine, patented Blackbeard for Men — the instant, no-hassle, look-younger-in-seconds gray beard wiper-outer. And if ye happen to order some of this nonsense seen in the photo, ye be doing yerself a favor if ye did exactly what this matey did — throw it back.